Thornborough Henges, which have been referred to as 'The Stonehenge of the North', is one of the most important ancient sites in Britain. It consists of an unusual prehistoric monument complex which features three aligned henges from which the site derives its name. 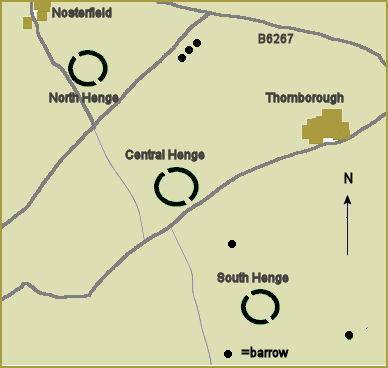 Thornborough Henges have been described by English Heritage as "the most important prehistoric site between Stonehenge and the Orkneys". The Scheduled Ancient Monuments stand along a flat plateau of land between the Rivers Ure and Swale and are located close to the villages of Thornborough and West Tanfield, near to the North Yorkshire town of Masham. The complex includes several huge ancient structures which include a cursus, henges, burial grounds and settlements, which are believed to have once formed part of a Neolithic and Bronze Age 'ritual landscape' which date back from between 3500 and 2500 BC. The three henges are almost identical in size, each having a diameter of approximately 240 metres and rising some 3 metres in height. Two large entrances are situated directly opposite each other. The henges are located around 550 metres apart on an approximate northwest-southeast alignment, although there is a curious 'dogleg' in the layout.The monument extends for more than a mile, making it the largest ritual religious site in the British Isles. Archaeological excavation of the central henge has been carried out. It is thought that its banks were once covered with locally mined gypsum. The resulting glittering white sheen would have been clearly visible for miles around. A double alignment of pits, possible evidence of a timber processional avenue, extends from the southern henge. Archaeologist Ian Longworth stated - "A ceremonial avenue, running for nearly a mile in a northeast / southwesterly direction. The avenue is defined by ditches 144 feet apart with a bank running along the inside of each ditch. The ditches are now completely filled with plough soil and, as with other cursus monuments in the county, were discovered from the air as two dark lines in the cereal crop. Probably used for ritual ceremonies, no clues remain to show what actually took place." The 'dogleg' in the layout appears to cause the layout of the henges to mirror the three stars of Orion's Belt. The exact purpose of the henges is unknown, although archaeological finds suggest that they served economic and social purposes as well as astronomical ones. The Northern henge is currently overgrown with a plantation of trees but is said to be one of the best preserved henges in Britain. It still retains a high bank and deep ditches with two entrances both of which are clearly defined. The Central and Southern henges are in a poorer condition. The central henge is the most accessible, however, its banks have been badly damaged in places and little trace remains of the interior ditch. 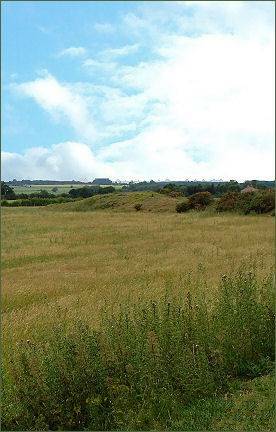 Thornborough is part of a larger ritual landscape which included the standing stones at nearby Boroughbridge. The three Thornborough henges and the narrow strip of land which connects them together are situated on privately owned land and therefore there is no official public access. However, the site does attract a steady stream of visitors throughout the year. 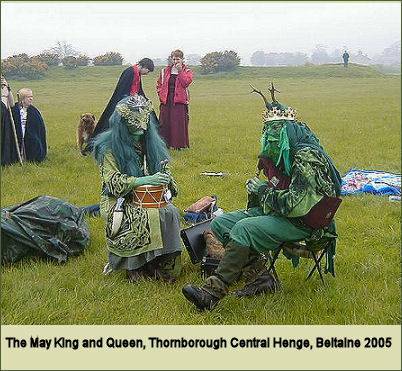 Since 2004 there has been an opportunity for public access to the central henge, to attend the celebration of the ancient Celtic festival of Beltane, a fire festival on 1st May which marked the beginning of summer. The festival commenced with the tradition of lighting 'lucky fires' at the start of May. These fires were believed to provide magical protection to people and livestock, druids were said to have once performed this ancient rite. Beltane celebrations had largely died out in Britain by the mid twentieth century, although some of its customs continued and in some places it has been revived as a cultural event.